Located on Cocoa Beach, moments from the golden sands, the Hilton Cocoa Beach is a relaxed beach retreat with easy access to the main attractions of the area. The rooms and suites here are spacious, stylish and comfortable, helping you to unwind and settle in straight away. There are some great facilities on-site, including a 24hr fitness centre, volleyball courts on the beach and nature walks through the scenic surroundings. Kids are kept entertained with the addition of an activity programme while adults can enjoy the heated outdoor pool and relax with a cocktail at the poolside bar. Top tip: When staying in Cocoa Beach you simply must visit the Kennedy Space Centre Visitor Complex. Ask your travel expert to reserve your tickets. 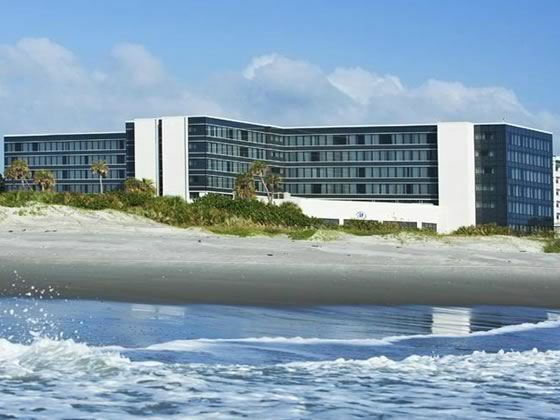 This gorgeous hotel is located on the sparkling sands of Cocoa Beach. Prices correct as at 6pm on 18 Apr 2019. Please call for final price. Prices are per person based on 2 adults & 2 children sharing. Other durations available - call for quote. Prices include flight and accommodation as stated below and car hire including Dollar rent-a-car's 'fully inclusive' insurance package. For more car hire and transfer options please ask your travel expert. For the purposes of the prices above, children are assumed aged 11 and under. Teen prices also available.